Dienekes’ Anthropology Blog: Ex oriente, Plague! 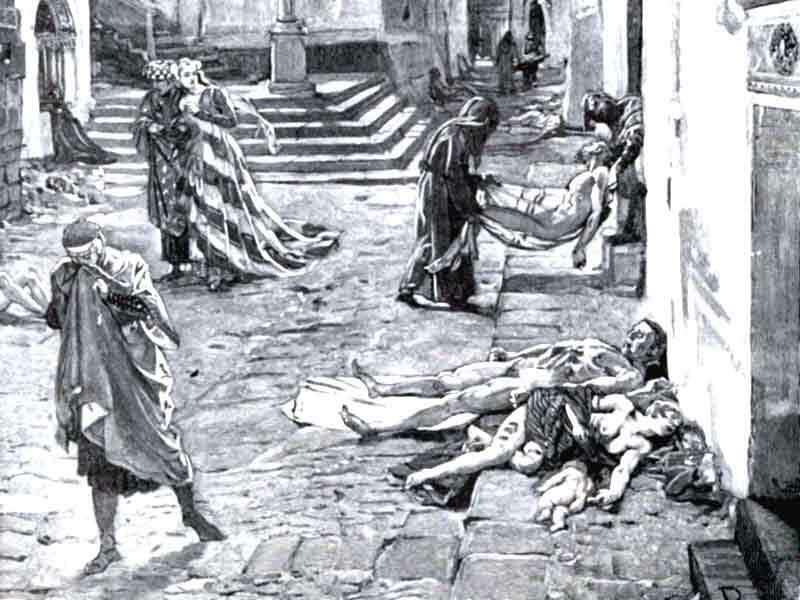 From AD 1347 to AD 1353, the Black Death killed tens of millions of people in Europe, leaving misery and devastation in its wake, with successive epidemics ravaging the continent until the 18th century. The etiology of this disease has remained highly controversial, ranging from claims based on genetics and the historical descriptions of symptoms that it was caused by Yersinia pestis to conclusions that it must have been caused by other pathogens. It has also been disputed whether plague had the same etiology in northern and southern Europe. Here we identified DNA and protein signatures specific for Y. pestis in human skeletons from mass graves in northern, central and southern Europe that were associated archaeologically with the Black Death and subsequent resurgences. We confirm that Y. pestis caused the Black Death and later epidemics on the entire European continent over the course of four centuries. Furthermore, on the basis of 17 single nucleotide polymorphisms plus the absence of a deletion in glpD gene, our aDNA results identified two previously unknown but related clades of Y. pestis associated with distinct medieval mass graves. These findings suggest that plague was imported to Europe on two or more occasions, each following a distinct route. These two clades are ancestral to modern isolates of Y. pestis biovars Orientalis and Medievalis. Our results clarify the etiology of the Black Death and provide a paradigm for a detailed historical reconstruction of the infection routes followed by this disease. Plague is a pandemic human invasive disease caused by the bacterial agent Yersinia pestis. We here report a comparison of 17 whole genomes of Y. pestis isolates from global sources. We also screened a global collection of 286 Y. pestis isolates for 933 SNPs using Sequenom MassArray SNP typing. We conducted phylogenetic analyses on this sequence variation dataset, assigned isolates to populations based on maximum parsimony and, from these results, made inferences regarding historical transmission routes. Our phylogenetic analysis suggests that Y. pestis evolved in or near China and spread through multiple radiations to Europe, South America, Africa and Southeast Asia, leading to country-specific lineages that can be traced by lineage-specific SNPs. All 626 current isolates from the United States reflect one radiation, and 82 isolates from Madagascar represent a second radiation. Subsequent local microevolution of Y. pestis is marked by sequential, geographically specific SNPs. Very cool that the Black Death turns out to have come from China. I would've guessed it'd come from some dense highly populated area, but it's surprising that it made it all the way from China. The company I work for does a lot of gene discovery software, so it's interesting to read how those scientists came to the conclusion that the Plague came from China. The time frame is well within the Chinese historical record. Is there any evidence of Black Plague outbreaks in China, or was the local population immune? I can't imagine Chinese chroniclers missing it. Another example of Diamond's GGS. That's funny, I dated a Yersinia Pestis researcher 6 years ago, and she told me that it was the cause of plague and was from China - I thought this was common knowledge?! I remember reading that the Mongols tossed plague bodies over the walls of Caffa in the Crimea, and that's how it spread to Europe. I looked at the history more closely. The Justinian Plague of 541 CE, was the first round of the plague in Europe and is believed to have arrived in Constantinople via a grain ship from Egypt (and presumably there from points East via trade). The NY Times report says that the origin of the plague is dated to 2600 years ago (i.e. 600 BCE) in China, apparently based on mutation rate dates, which would be in the extremely well historically documented Spring Autumn Period of the Eastern Zhou Dynasty in China. We have annual historical records for hundreds of years that report events like locust plagues, malaria outbreaks, minor local wars and the health of kings from that time period, we have the Confucian Analects from that time period. We have Chinese medical textbooks from that time period. But, upon spending considerable time yesterday skimming translations of texts from that era, it appears that there is nothing in any of those records indicating anything like the Black Plague, and given the diseases tend to be most intense upon their first appearance before anyone has developed immunity to them, it is hard to believe that something like that could have escaped the notice of medical and historical record keepers of China then. Also, if the course of the first outbreaks in China were anything like the course of the first outbreaks in Europe, it would have hit not just once, but in several distinct episodes over a couple hundred years. There is just no way that something that big could have escaped the historical record in that era in China. There also aren't any obvious cultural legacies of the black plague in greater China that would have survived for hundreds of years from times or places that lacked writing, which the intense impact of the black plague left in Europe for many centuries some of which can be teased out even today (e.g. Ring Around the Rosie). In contrast, we do have at least cryptic historical records to the immense suffering in the drought in the Akkadian empire ca. 2000 BCE (a curse was left behind), the pre-demise Saravasti River system that was gone hundreds of years before the Vedic epics described them in writing, and possibly to the Thera erruption hundreds of miles from the place where it happened (Egyptian records of the destruction of Atlantis that make their way into our records via Plato). So, an initial outbreak had to have been really far off the map. Anyway, either the date is wrong by a large enough margin to escape historical notice (e.g. if the plague was 3900 years old, rather than 2600 years old), or the plague arose somewhere else in East Asia or Central Asia that did not have writing yet (e.g. "barbarian" Northeast Asia or Central Asia on the Silk Road, or the Spice Islands), and the version of the plague that hit China in the 19th century just happened to be close to the basal branch of plague pylogeny.